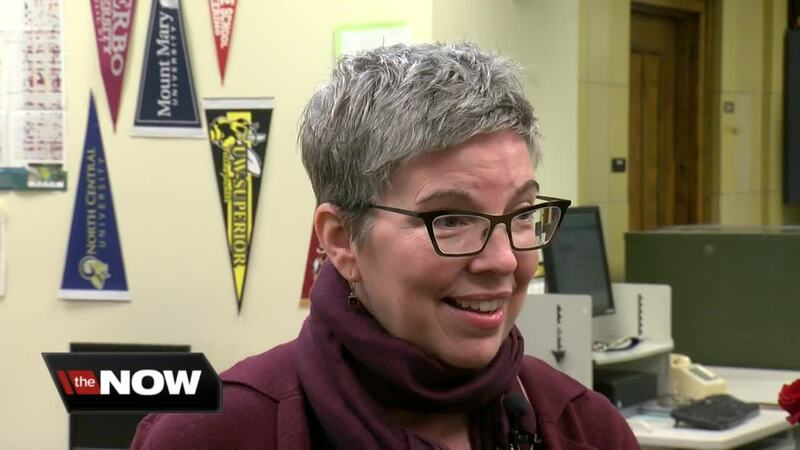 MILWAUKEE — The Marcus Center and staff at Rufus King International High School in Milwaukee surprised teacher Kelly O’Keefe-Boettcher on Friday morning, recognizing her as the Marcus Center’s “Teacher of the Year” for how she keeps Martin Luther King Jr.’s message alive in her classroom. “Every year when I see teachers being honored, I think, ‘I want to meet that teacher, that teacher must be such an inspiration,’ “ O’Keefe-Boettcher said. Now, O’Keefe-Boettcher is part of that inspiration herself. Her students said she encourages them to look to King as an example. Rufus King junior Cedric Banks said that O’Keefe-Boettcher inspired him to join a peer mediation group. “She kind of showed me how I can use my leadership skills to better the school and my atmosphere and my community around me,” Banks said. Banks said she teaches about MLK’s legacy and shows students how revolutionary he was to the world. “He cannot be dismissed. His life and his message must be protected and sustained,” O’Keefe-Boettcher said.